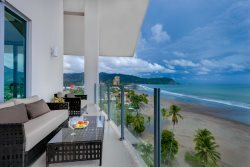 This masterfully designed three bedroom, two bath condo comes fully furnished and comfortably accommodates groups of up to 6 people, making it a perfect fit for families and groups looking to vacation together without having to compromise on personal space or luxury. The open-concept living area features comfortable seating, a flat screen TV, and sliding door access to a large, private patio, where you and your guests can directly access the pool or dine and lounge in style while taking in stunning views of Jaco that surround you. The spacious kitchen is fully equipped to meet all your cooking and entertaining needs, with full-size stainless steel appliances, granite countertops, a dining table and a large breakfast bar. Other kitchen appliances include a fridge, freezer, dishwasher, oven, toaster, blender, coffee maker and microwave. The master bedroom features a king-size bed, in-suite bathroom, flat screen TV and sliding door access to the patio. The first guest bedroom features a king-size bed, in-suite bathroom and access to a private guest patio. The second guest bedroom features a queen-size bed and access to a private guest patio, and is just steps down the hall from a full guest bathroom. To top it all off, other amenities include plush pillows, premium linens, upgraded floors and cabinets, stylish décor and an in-suite laundry room, equipped with a full-size washer and dryer unit. All in all, this unit has everything you and your guests need to make your dream vacation a reality, so, don't wait- book your stay in this unit today!